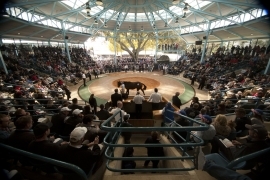 The average and median prices headed upwards on Day Two of the 2012 Inglis Australian Easter Yearling Sale, where overseas interests fought hard against local buyers to secure their next champion. 120 yearlings were sold today at an average of $238,583 and median of $180,000, comparable to last year’s overall average and median of $238,260 and $180,000 respectively. The clearance rate from Tuesday’s session has climbed to 79% thanks to private sales flowing in, with today’s clearance rate of 75% also expected to increase over the coming days as vendors and buyers are brought together via the Inglis Make-An-Offer service. “On the back of Pierro’s win in the Golden Slipper on Saturday it was certainly pleasing to see Champion sire Lonhro get his much deserved recognition in the Easter sale ring with two of his colts topping half a million today to top judges George Moore and James Bester,” Inglis Managing Director Mark Webster said. “The Helsinge filly was the jewel in the crown selling to BC3 for $2.6million, but overall today’s session was strong throughout and I must congratulate our loyal vendors on meeting the market,” Webster added. They might have been the under bidders on Black Caviar’s half-sister but buyers from Japan were not deterred today, taking home six yearlings for $1,435,000. Buyers from Hong Kong were also strong, purchasing seven lots for $2,085,000, while UK agent David Redvers added another two fillies to the three he purchased on Tuesday for Melbourne Cup winning owner Sheikh Fahad al Thani of Qatar. James Bester also had a successful day, purchasing three lots for $340,000, $510,000 and $600,000. Coolmore Stud head the vendors list after two days having sold 21 lots for just over $5million, while Yarraman Park Stud, Edinglassie Stud and Kia-Ora Stud have all managed a 100% clearance rate so far, netting $7,892,500 for the 32 they have sold between the trio of Hunter Valley operations. Horses passed in over the past two days are still available for sale via the Inglis Make-An-Offer service. The sale continues from 11am tomorrow with the remaining Session One yearlings to be offered as Lots 381 to 451, before the Session Two offerings from Lot 452 to 579. Online Bidding will again be available tomorrow for those buyers unable to attend the Newmarket complex.